Hallman Farms Wildlife Nursery has the solution for the outdoorsman who wants to bring home the Trophy. Our varieties of trees grow rapidly and quickly produce tasty treats that wildlife cannot resist. Benny Hallman, along with his wife Janice, son Kenny, daughter Deena, and son-in-law, Hannon Bedenbaugh founded Hallman Farms Wildlife Nursery. Benny holds a Master of horticulture degree from Clemson University. He began his career with the Clemson University Extension Service, performing soil and leaf analyses on South Carolina’s peach crops. An interest in grafting resulted in Benny becoming proficient at propagating fruit trees. Grafting and budding (a type of grafting) are a form of asexual reproduction that produces a tree exactly like the parent tree. These methods are used on hybrid trees, which include both pears and apples. Seeds from these trees have genetic variability which will produce trees with different characteristics than the parent trees. Grafting produces a clone of the parent tree. For example, one of our signature deer pear trees, ‘Trophy,’ is budded onto a root stock that is vigorous and able to withstand a wide variety of soil conditions. ‘Trophy’ produces extremely heavy crops, and begins producing fruit at an early age that ripens and starts to fall in early months of deer season. Another signature variety, ‘GioVan,’ produces a very heavy crop that ripens and falls toward the end of deer season. This fruit will be falling long after most acorns are gone, making this tree and the ‘Doc’s Special’ (another later producing variety) a great attractant for deer. The ‘Lo Country’ drops fruit in August, which works well in regions that have an early hunting season. 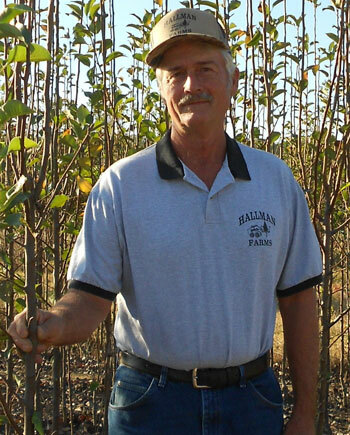 Our staff combines many years of experience as both growers and hunters. We can give expert recommendations on what we have seen work in the field. We will continue to be developing new varieties of pears and apples whenever trees with superior characteristics are located. Although our signature trees have been no secret, they have previously been available to hunters through Edward Fort Nurseries. We will continue to carry these products, just straight from the field and grower. Our entire family looks forward to serving you with your hunting needs.